GNC Herbal Plus Turmeric Curcumin Review | Does It Work? 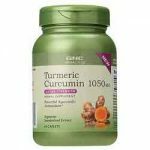 GNC Herbal Plus Turmeric Curcumin Review – Is This Product Safe To Use? What is GNC Herbal Plus Turmeric Curcumin? GNC Herbal Plus Turmeric Curcumin is a dietary supplement that is touted to be packed with a potent dose of Turmeric Curcumin. The product is designed to quickly and effectively offer joint support by reducing joint inflammation and muscle stiffness. GNC Herbal Plus Turmeric Curcumin is available for purchase over the counter without a prescription. Being a GNC product, it is readily available in all GNC stores (for the 60 capsule bottle). The price varies on other stores and depending on the shipping method selected. What is the Company Behind GNC Herbal Plus Turmeric Curcumin? 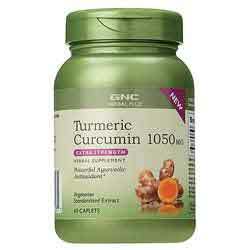 GNC Herbal Plus Turmeric Curcumin is a dietary supplement made using natural anti-inflammation ingredients. The producers have described it as a highly potent anti-oxidant and anti-inflammation product. GNC Herbal Plus Turmeric Curcumin is a product of General Nutrition Corporation. This is a world-renowned company headquartered at Pittsburgh, Pennsylvania. GNC is famous for its nutritional products has produced a range of dietary supplements and other health products. They run their own distribution chain with various brick and mortar stores all over. What are the Ingredients Used in GNC Herbal Plus Turmeric Curcumin? Turmeric root extract – This is a popular Indian spice considered to be a potent anti-oxidant. Research shows that this extract inhibits pro-inflammatory cytokines and enzymes that are notorious in causing swelling and joint pain. How GNC Herbal Plus Turmeric Curcumin Works? GNC Herbal Plus Turmeric Curcumin works by fighting inflammation. Inflammation is one of the leading cause of joint pain in the world. The main working formula of GNC Herbal Plus Turmeric Curcumin heavily relies on power to fight inflammation. GNC Herbal Plus Turmeric Curcumin has the ability to fight inflammation given that it stops the production of inflammation-causing cytokines and enzymes suchas 5-lipoxygenase. By stopping this enzyme, GNC Herbal Plus Turmeric Curcumin gives the joints a fighting chance and the opportunity to protect themselves. This means that the joints will have room to repair and heal. GNC Herbal Plus Turmeric Curcumin is thus touted to help joint regain their normal health by fighting joint inflammation. It is worth nothing noting that inflammation is the most abundant cause of joint and thus by fighting inflammation we can say we have fought joint pain. What are the Pros of GNC Herbal Plus Turmeric Curcumin? What are the Cons of GNC Herbal Plus Turmeric Curcumin? The recommended dosage of GNC Herbal Plus Turmeric Curcumin is two capsules daily with lots of water. They can be divided into a single serving or into two separate servings. Is GNC Herbal Plus Turmeric Curcumin A Scam? GNC Herbal Plus Turmeric Curcumin is, not a scam. It is made by a company that is world renowned. The production process of GNC Herbal Plus Turmeric Curcumin is described by many as “near pharmaceutical standard”. We have not heard of any complain associated with the correct use of GNC Herbal Plus Turmeric Curcumin and thus this product has our green light. GNC Herbal Plus Turmeric Curcumin is a decent product when it comes to fighting inflammation. A few years ago, this product would have been more than enough to take care of joints, however, the modern lifestyle needs much more than turmeric to guarantee healthy joints. We have featured other products with turmeric but fortified with vitamins and minerals. We believe that such products can effectively compete with GNC Herbal Plus Turmeric Curcumin.